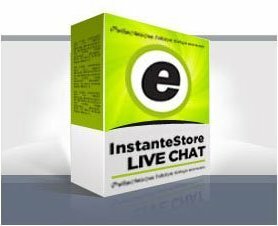 Instant-e-store live chat enables website visitors to chat with the customer service agent on your website. This software is really useful for e-commerce website. Adding a live chat to a website helps build trust in the minds of the visitors. E-commerce , Web Hosting , VoIP, and similar websites would be benefited if they use live chat. So make sure you add live chat to wordpress. How to add live chat to wordpress ? You can also choose a variety of Live Chat buttons or Customize it according to your wish.Whenever you are logged in to the software the chat button in your blog/website will go green that means your are online.your customers can easily chat with you without needing a sign-up.